506 West Bay Area Blvd. Hampton Inn and Suites Houston Clear Lake-NASA hotel is located on West Bay Area Boulevard in the heart of Webster and within walking distance of restaurant row. This Houston Texas hotel is 25 miles from downtown Houston and Galveston Beaches and just one quarter mile off Interstate 45. Area attractions close to the Hampton Inn and Suites hotel in Houston Texas include the Space Center Kemah Boardwalk Waterfront ice skating museums and monuments shopping malls water sports bay tours greyhound racing Moody Gardens Theme Park and within walking distance there are many major restaurants close to this Texas Hampton Inn Suites hotel. The Hampton Inn and Suites Houston Clear Lake-NASA hotel features five stories 108 rooms 29 suites and 79 rooms a fitness center an outdoor pool and hot tub. At this Houston Texas Hampton Inn and Suites hotel standard room amenities include complimentary On the House hot breakfast fully-equipped kitchens with coffee maker hair dryer iron and ironing board complimentary High-Speed Wireless and Wired Internet Access in-room movie channels and a copy of the USA Today delivered Monday through Friday. 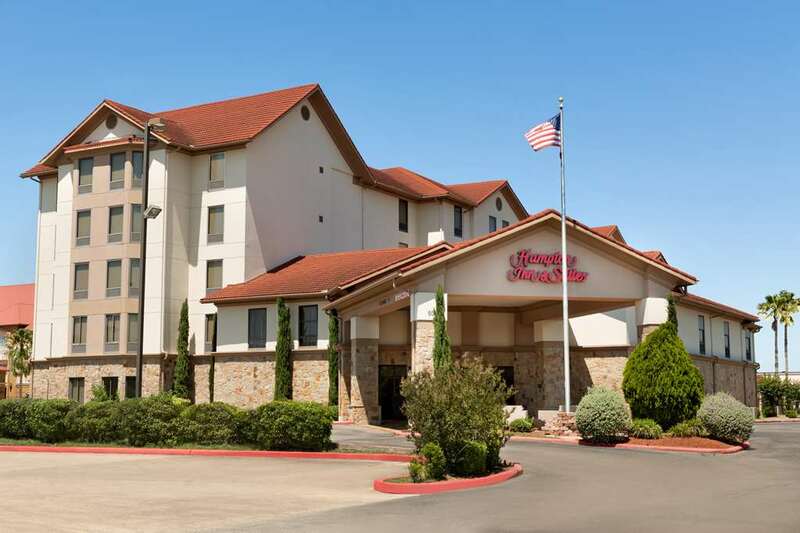 Our Hampton Inn hotel in Houston Texas also offers connecting rooms cribs and valet service along with on-site guest laundry facilities. We love having you here at the Hampton Inn and Suites Houston Clear Lake-NASA hotel in Houston Texas. Carrabba*s: Great family dining with Italian flavors. Pastas pizzas and deserts. Located adjacent to the hotel. Only hotel in area that restuarant will provide in-room service delivery to. Perry*s Steak House: For upscale elegant dining this restaurant offers fine cuisine and deserts.